Custom Imprinted Color Mirrored Navigator Sunglasses are made available in 5 amazing color options such as Blue, Green, Yellow, Silver or Red Mirrored lenses, all with Silver frames. Apart from that there is a 1" W x ¼" H imprint area in the lenses, which is great to increase your brand awareness among people. These custom Navigator sunglasses with UV400 lenses can provide 100% UVA and UVB protection. 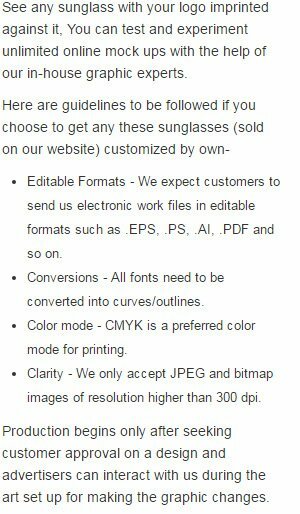 Order these custom sunglasses now to grab our free artwork design and free online proofs facilities. Request a quote to know the value savings that you can avail on bulk orders of Custom Imprinted Color Mirrored Sunglasses. Available Colors: Silver Frames with Blue, Green, Red, Silver, Yellow Mirrored Lenses.